You have to see this home yourself to appreciate the mountain views from the deck and every window! Located in the Kings Valley neighborhood, this home is a peaceful oasis away from it all, yet a quick drive to Denver or a headstart to all your favorite outdoor mountain activities via highway 285. Avoid I 70 traffic and take a quick drive to Breckenridge, or hike and snowshoe in the nearby gorgeous Staunton State Park. Paved county maintained roads and public sewer and water make living in the mountains a breeze. 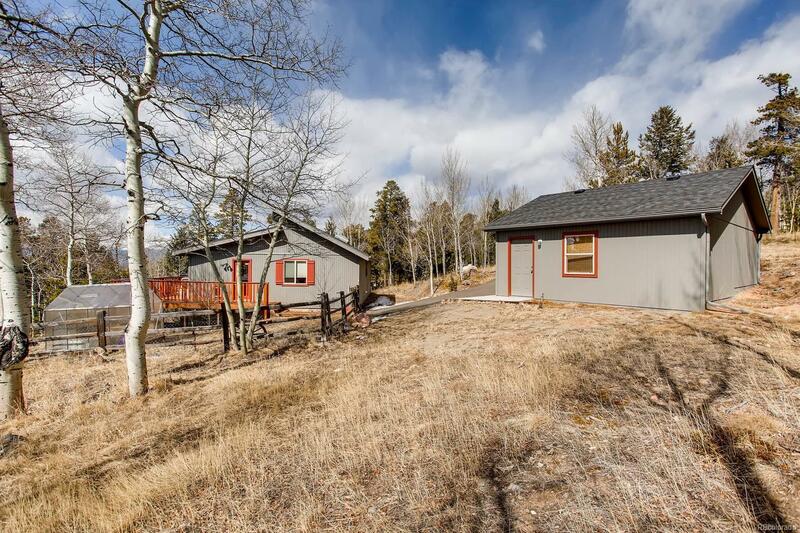 Nestled in the aspens, the flat property is fenced for your four legged family members and includes a paved driveway and lots of storage in the crawl space and new 2 car garage. There are no stairs in the ranch style home, and the vaulted ceilings and open concept floorplan make this home feel spacious. The owners have taken great care of the home with new exterior paint and gleaming hardwood floors making it move in ready! Selling Office: Good Mountain Real Estate, Inc.